PTNA is a nonprofit organization of professional piano teachers. Will Music Learning Be An Advantage For University Admissions? In Japan, music can be learned almost exclusively at music colleges. For those who would like to go to universities, they are likely to study only the subjects required for entrance exams and even quit playing piano. However, the situation is changing. In recent years, the Ministry of Education (MEXT) has addressed the new formula for the National Center Test for University Admissions (The National Center Test) from the year 2020. In this case, there is a possibility that music learning will be an advantage for all the candidates. This new policy points out 3 key elements in learning process and achievement ; acquisition of academic knowledge and skills / thoughtful mind, decision-making, expressing abilities / collaborative learning attitude with independent mindset. It seems similar to what we expect in the music learning. There are 3 major reforms in the formula of university admissions. 1. For those who will take AO entrance exam and exams for selected candidates are obliged to be evaluated by the way each university asks for (essay, presentation, oral-exam, performance, etc. ), besides submitting application forms. It might be possible that "awards in piano competitions" could be acknowledged as one of the criteria. For those who will take general exam, they are recommended to show additional documents that testify how active and multifaceted they are when studying with other people. In this case, the extra activities like music learning might be advantageous. 2. The criteria will be expanded to evaluate candidates' personalities, behavioral characteristics, learning attitudes, extracurricular activities, volunteer activities, experiences of studying abroad, certificates, prizes & awards, etc. Therefore, candidates will be able to write as many awards and activities as possible. 3. The National Center Test will be transformed to The New Common Test for University Admissions from 2020. In Japanese language and math, essays will be taken in. English will be evaluated by 4 items (reading, listening, speaking, writing) and exams in the private sector will be applied. In the past 15 years, the rate of the candidates of AO Exam and Exam for selected candidates has been increasing from 33.1% to 43.5%. In 2016, University of Tokyo started to apply Exam for selected candidates for the first time, and this trend is expected to expand. Akane Takahashi, a freshman at the Hiroshima University (Department of Education), chose the music course to study piano in depth, as well as to learn music pedagogy properly for her future. She also would like to learn more broadly to understand how music is connected to other academics like history or religion. For the entrance exam, she studied music theory, Chorübungen, piano performance, music history, and music pedagogy. She also practiced writing essays and prepared for the interview. She submitted documents that show her awards at piano competitions. She confessed that it was hard to study general subjects for the Center Test besides music at the same time, but it brought her success at the end. She would like to proceed to the graduate school to learn further about music and music education. Nowadays, music colleges are changing. 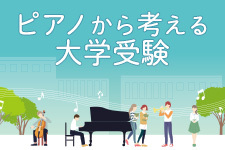 So far, the focus was put on the one-to-one intensive instrumental/vocal lessons, but this year, Tokyo College of Music established a new course called "Music Liberal Arts" which combines music study with humanities, social sciences, and natural sciences. Other colleges, such as Kinjo Gakuin University (Music & Arts Course) and Osaka Music College (Music Communication Course), also have similar education philosophy which aims at nurturing personalities who can connect music and other fields in society.